As you read last Friday in my review of Eat Natural bars from the UK, I recently spent time in London, and of course tried out the local snack bars while I was there. 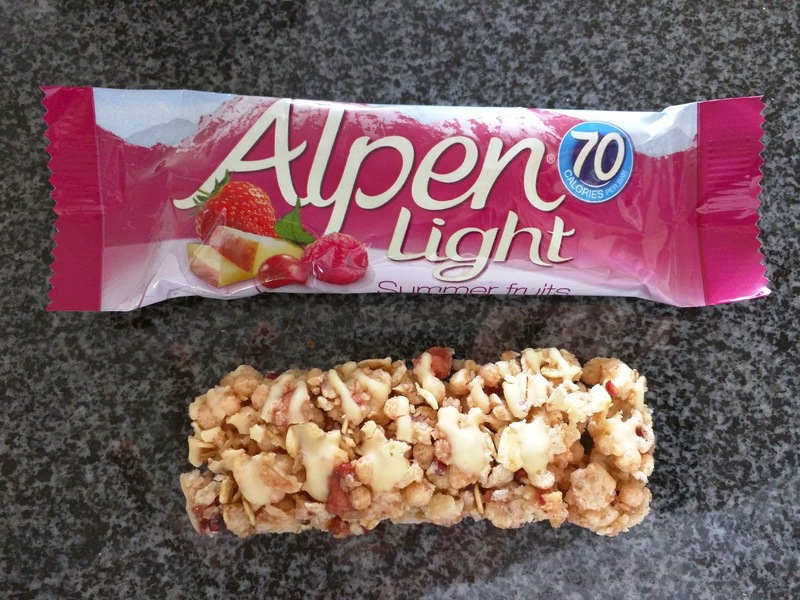 Alpen bars are made by Wheatabix, a UK cereal producer, that also makes assorted porridges and other breakfast items, along with grab and go snack foods. Their signature product is the Wheatabix cereal, but they also produce a line of muesli, Alpen, and cereal bars made from it. The bars are indeed a light offering, only 70 calories, but they don't exactly offer much nutritionally, with less than a gram of protein each. And the regular bars are only ~120 calories, so they aren't exactly a heavy choice. Since they are made from cereal, I guess they are designed to be an easy breakfast? "Mixed Cereal bar with Apple, Sweetened Cranberry, Raspberry, Strawberry and a Yogurt Flavour Drizzle." This reminded me a lot of Special K cereal bars (which, I just realized I haven't reviewed. Stay tuned!). The base is a mix of assorted rice puff cereal and wheat based cereal, and it was studded with little bits of dried fruit. It wasn't as overly sweet as the Kashi version, but, it also wasn't particularly flavorful. The little bits of fruit inside provided the only little pops of flavor. The "yogurt flavour drizzle" on top didn't provide much sweetness nor interesting component either. Overall, very meh, meh, meh. I've been focusing on bakeries lately on my Thursday reviews, but, the day is intended not only for baked goods, but also for my other favorite sweet: frozen things! This normally means froyo or ice cream, since they are the most widely available, but every once in a while I do find other treats, like gelato. La Copa Loca is an "Artisan Gelato" shop in the Mission, and got on my radar as they were named Best Ice Cream in 2008 by SF Weekly magazine (although, not technically ice cream). What do they have at The Crazy Cup? A large selection of gelato, plus soy gelato, sherbet, and sorbet, all made in house. At any given time, they have about 20 flavors available, although they make hundreds of flavors including interesting selections like port & balsamic vinegar, white chocolate basil, goat cheese & figs, or even dark chocolate with candied jalapeño. They offer standard toppings, wet or dry, to make sundaes, plus smoothies, shakes, ice cream pies, profiteroles, and crepes. Unfortunately, I never really cared much for any flavors I tried. Service has always been friendly, tolerating my desire to taste a few flavors before finally settling on my choice. The staff clearly are passionate about their products, on one visit the man serving me was very, very proud of a new rose flavor, and had every person who entered the shop taste it. They take only cash or LevelUp, and one one visit, I was handed my cone, and went to use LevelUp and was told it wasn't working. Doh. I had no cash. And a melting ice cream cone in my hand. Luckily, I had an ATM card on me, and offered to leave the cone behind and run to get cash nearby, but I was told to just pay them next time. Such trust, given that I am not a customer they knew! Kiddie Size Amaretto Gelato, Cake Cone, Rainbow Sprinkles. $2. On my first visit, I went for a cone, because it was a hot sunny day, and that just felt right. I added sprinkles because, well, sprinkles. 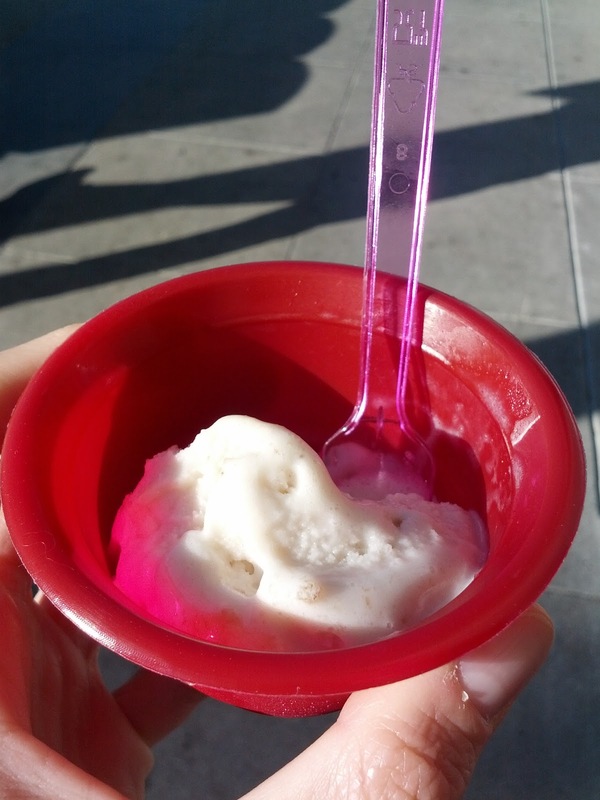 The amaretto gelato I picked was the creamiest of all of the gelato I tried, but it still wasn't that creamy. It definitely didn't seem like premium gelato. The flavor was decent, a bit nutty. Not particularly great, but not bad. The cone was a standard cake cone, but it was very crunchy. I originally thought it was stale, but flavor-wise, it didn't seem to be. Strange. I didn't realize there was such variance in cones. As you can guess, I didn't really like this much, but it was still a nice frozen treat on a sunny afternoon. 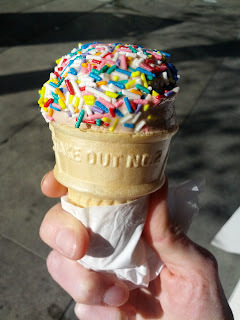 A kiddie size cone is only $1.75, a ridiculously good price for San Francisco. It actually was much bigger when it was first scooped, until he rolled it in the sprinkles and it got very smushed. The cone was completely full of gelato, no skimping here. The rock-sprinkles added on another $0.25, and I'd definitely skip them in the future. Kiddie Size Banana Sherbet. $1.75. On my next visit, I went for a dish. And, since I wasn't all that impressed with the gelato, I went for a sherbet. It was very strongly banana flavored. There were even large chunks of frozen banana in it. Since it was sherbet, it was not very creamy, kinda icy, and was really just not really that great. The price was again right though. Pumpkin (seasonal): Not much flavor, not very creamy. Rose: Not very flavorful. Someone else tasting it said it tasted very floral, but I barely picked up on it at all. Not very creamy either. Rum & Raisin: Very boozy, but I didn't get any raisins, nor raisin flavor. Again, not very creamy. Walnut: Very strange flavor, I wouldn't identify it as walnut at all. Apricot: Very tart, very sweet, incredibly flavorful, quite icy, but it was sorbet after all. 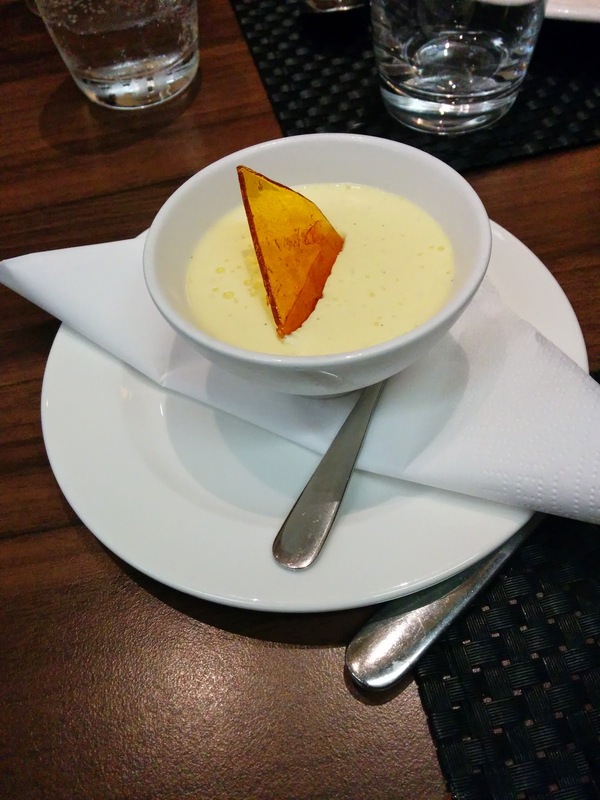 Last week, I reviewed Darbar, an Indian restaurant in San Francisco that I visited only to try their rice pudding. I've been on a quest to find good rice pudding, so more recently, I swung into the Indian restaurant that the SF Chronicle deems “the best Indian restaurant in town”. India Palace, located between Pac Heights and Japantown. India Palace is a fairly nondescript restaurant, with a small buffet in the corner. The staff were friendly, and offered me a seat while I waited just a few minutes to receive my order. Unfortunately, their rice pudding was among the worst I've encountered. Kheer: Basmati Rice Cooked with Milk. $2.95. As you can see from the photo, this was very watery rice pudding. The rice was overcooked, rather mushy. It was swimming in the sweet liquid, which didn't have much flavor. There were a few raisins and slivers of nuts, also very mushy. And ... it also contained a metal shard - bonus! So ... flavorless, poorly executed, and contaminated. I won't be getting this again. It was a fairly large serving, much bigger than what I've received at Darbar or Lahore Karahi , but it was also 50% more expensive. The price seemed reasonable for the portion size. My first visit to the Concorde room in Heathrow was en route to Mallorca, after our overnight flight from San Francisco, before heading on to Barcelona and a final hop to Mallorca. While the long flight was lovely, I was happy to be on the ground and get a chance to take a real shower before heading onward. The spa attached to the Concorde room easily met this need, and I was also able to get a massage, but I was still a fairly blurry eyed traveler at this point. I didn't take excessive notes or photos of the lounge itself (sorry! 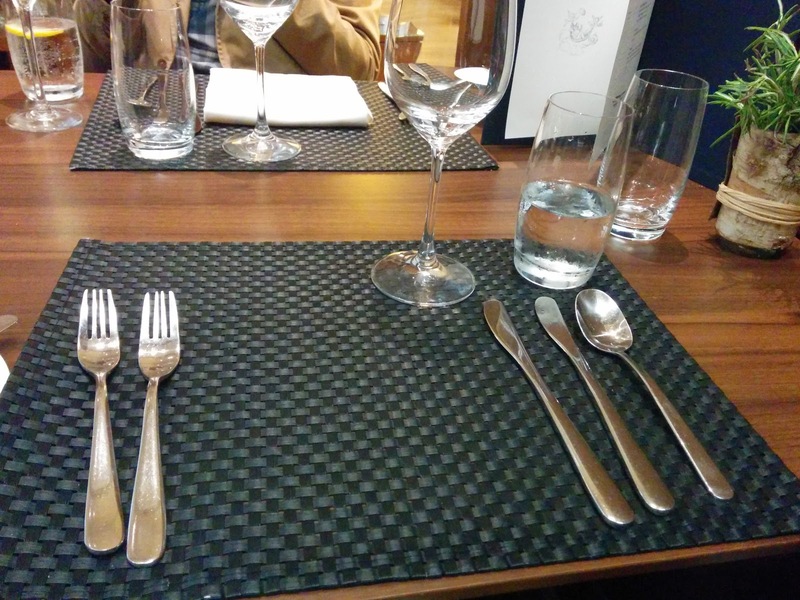 ), but I did of course focus on the meal, served in a formal, full service restaurant. Overall, the meal was quite disappointing. Service was nonexistent, the food was poorly executed and boring. But, the plating was really impressive, so at least it looked good? Plus, it was free, so I can’t complain, but … meh. I had higher expectations. 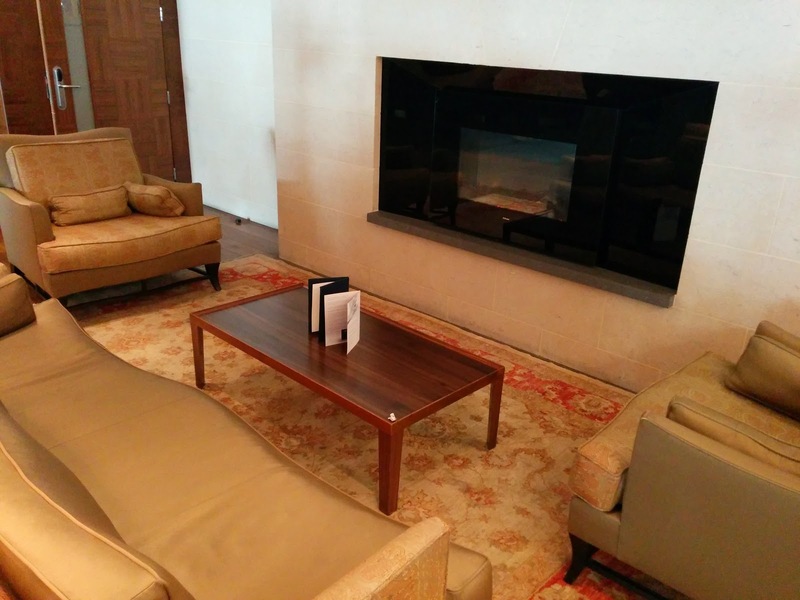 But the lounge itself was lovely. I started by wandering through the space exploring. I didn't take many photos, as I felt a bit strange doing so. Everyone was so civilized in there! There are a variety of seating options, including really comfortable couches. The fireplace gave a nice ambiance, although it was not running. The wifi worked well, always appreciated. 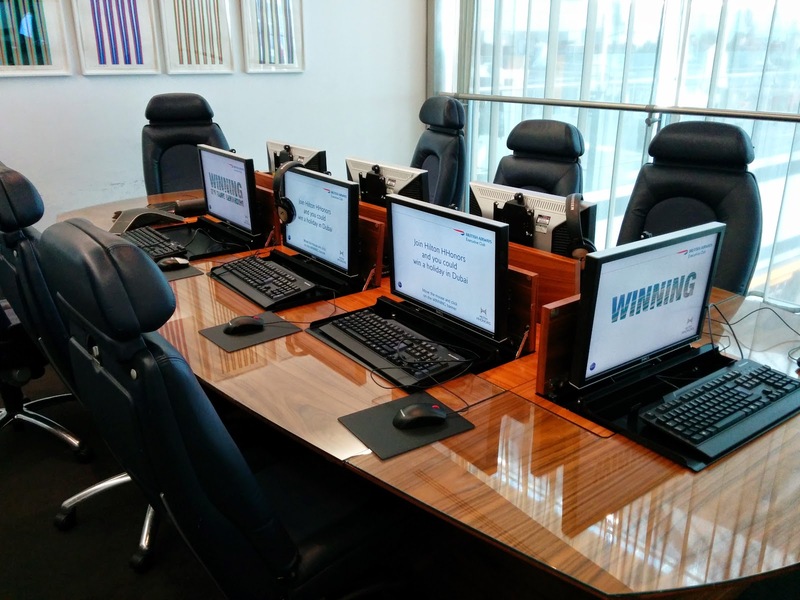 I was told to check out the board room, basically a big meeting room, with computers, and seats from the Concorde as the chairs. I was a little surprised that the room was empty, but then again, who really needs to have a 12 person meeting in the airport? The chairs were novel though, they even had tray tables on the backs. 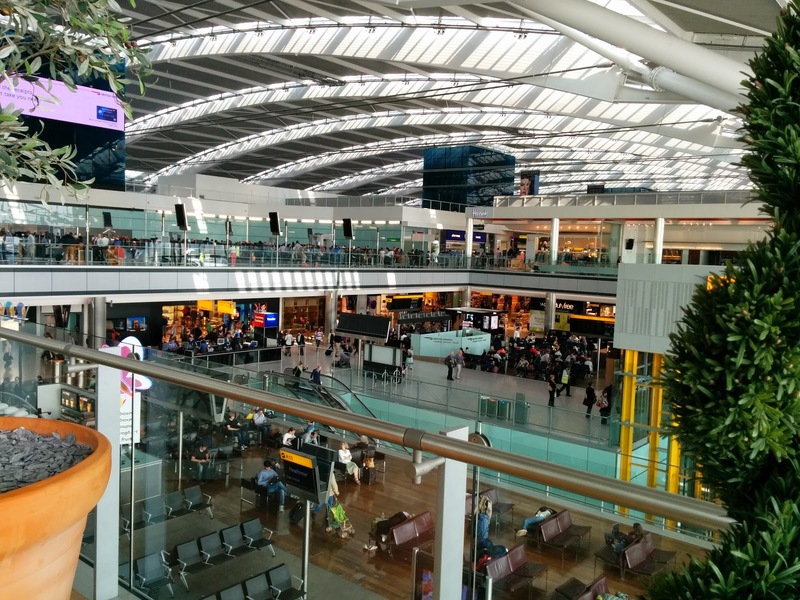 I also went to check out the terrace, similarly furnished to the inside area, but open air to the terminal. While it is obviously still indoors, it did have a more airy, outdoorsey feeling. It was a nice vantage point to look down on the chaos of the main terminal, and really appreciate my more tranquil environment we were hiding in. While I was out exploring, and others were still showering, Emil and Levi ordered appetizers from the Concorde room dining menu while they waited for us to return. 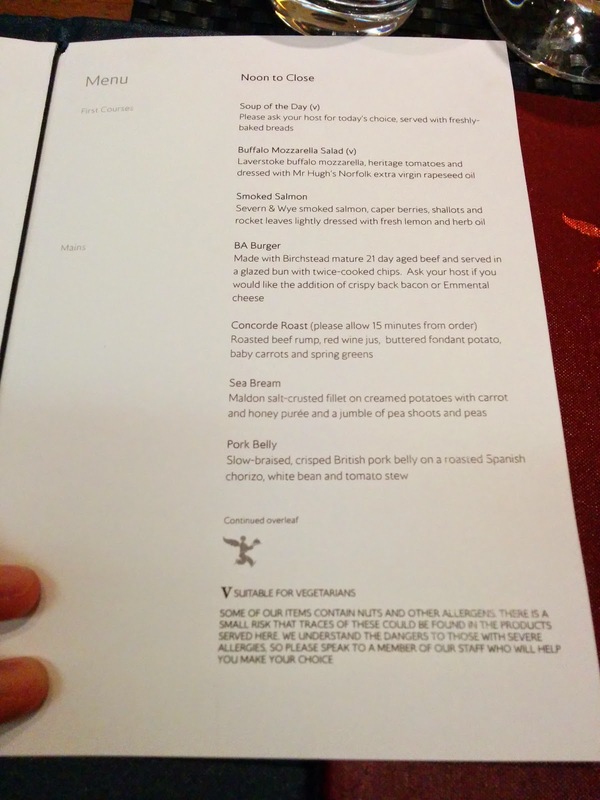 They choose to just get starters, and champagne of course, out in the main area, rather than going into the full restaurant, opting to wait for all of us before being seated for main dishes. You can order from the same menu anywhere inside the Concorde room, to dine as casually as you desire, so they could have certainly ordered their entrees in the bar area as well. 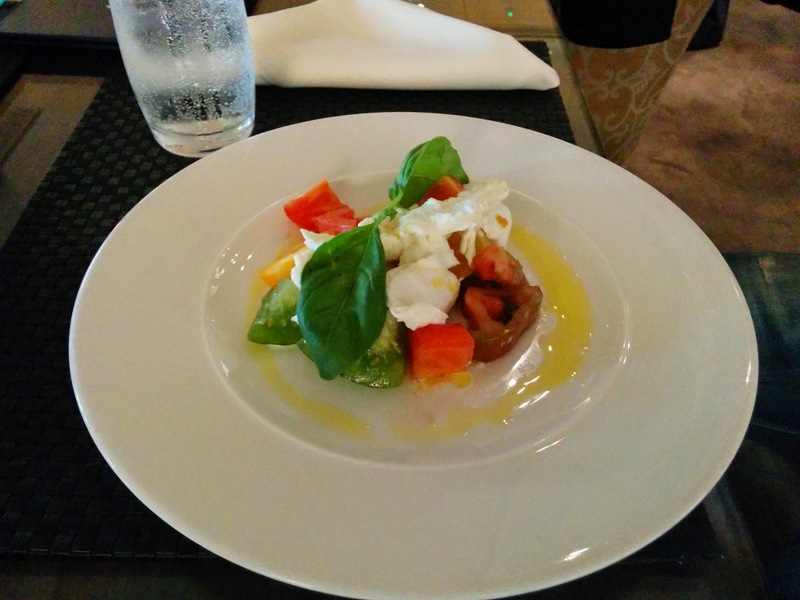 "Laverstoke buffalo mozzarella, heritage tomatoes and dressed with Mr. Hugh's Norfolk extra virgin rapeseed oil". Levi picked the mozzarella salad and clearly loved it. He said the green tomatoes in particular were amazing. I didn't get to try any, but the produce looked impressively fresh, particularly the basil. I thought it was funny that they named dropped the mozzarella and oil maker. I'm used to that in San Francisco, but at an airport, aren't most people travelers and less likely to actually recognize the brand name? I really have no idea if Mr. Hugh's is a good brand, but since they are pointing it out, it must be? 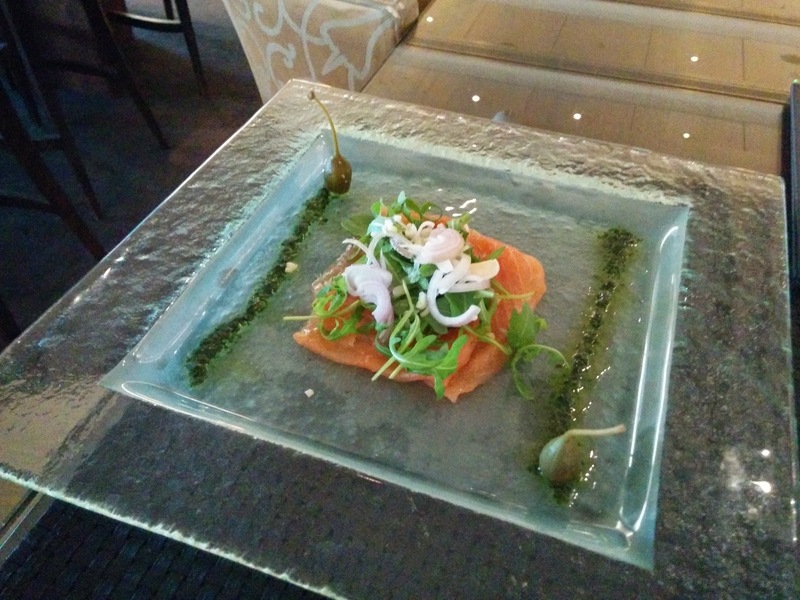 "Severn & Wye smoked salmon, caper berries, shallots and rocket leaves lightly dressed with fresh lemon and herb oil." Emil ordered the smoked salmon, and devoured his just as fast as Levi did his. He said it was quite good. He didn’t eat the caper berries, so I enjoyed those. And again, with the name dropping. Is Severn & Wye good salmon? I have no idea. After everyone returned from showering, we moved to the main dining room for a meal before our flight. We had about 45 minutes before we needed to leave for our gate, which seemed like plenty of time. Or so we thought. Service was crazy slow. Once we were seated, no one came to take our order. We waited and waited, and finally Emil went to track someone down. When we ordered, we mentioned that we were in a bit of a rush, and asked for everything to come at once, trying to stress not to bring things in a staged manner, since we didn't have tons of time. It didn't really work. The menu started with appetizers: the two appetizers that Levi and Emil already ordered, plus a soup of the day. No other choices, so we moved on. Next was entrees, ranging from a classic roast, to a simple burger, with sea bream and pork belly somewhere in between. 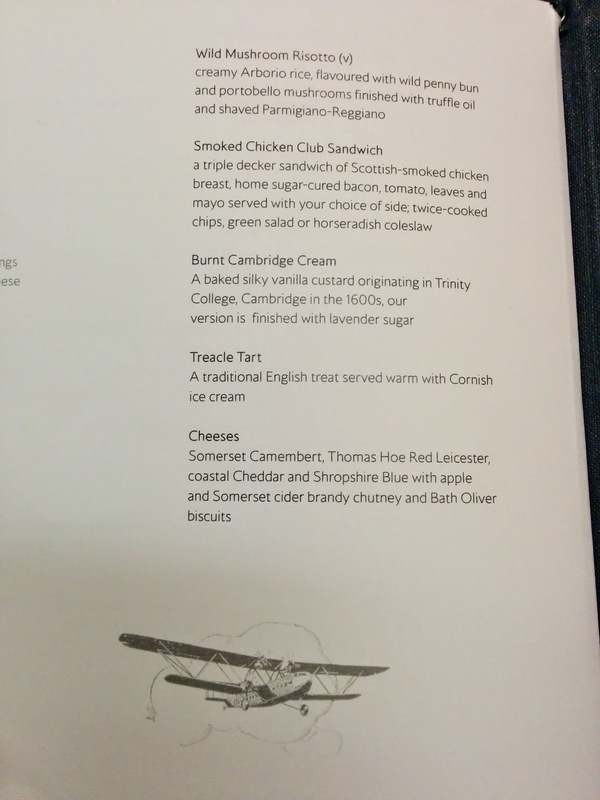 The menu concluded with two more entree choices, the most basic chicken club sandwich and the single vegetarian item, risotto. It was easy for me to rule out the chicken sandwich, the roast, and pork belly, but I was actually somewhat drawn towards the burger, and of course, I always like seafood. And ... 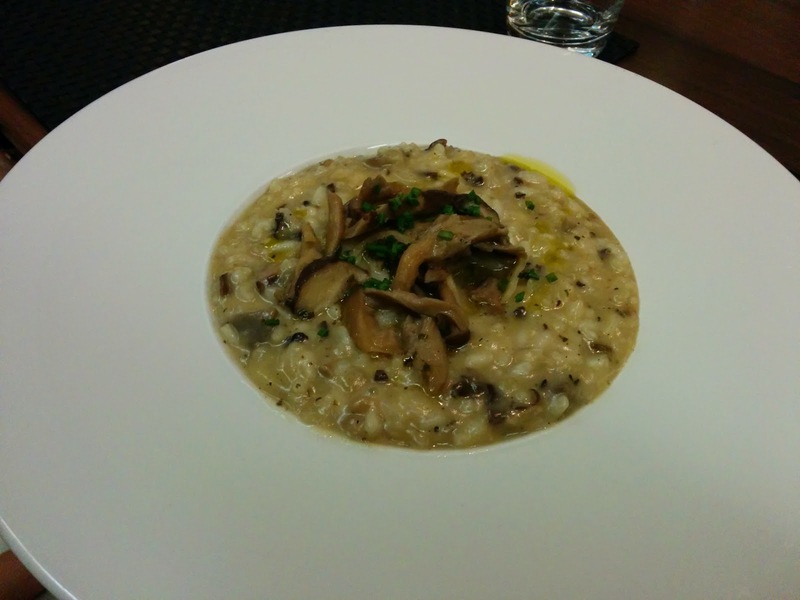 I do adore wild mushrooms, and a comforting, creamy risotto did also sound pretty good. Decisions, decisions! The menu also listed two sweet desserts, and a cheese plate. We also all ordered drinks when we placed our food order. 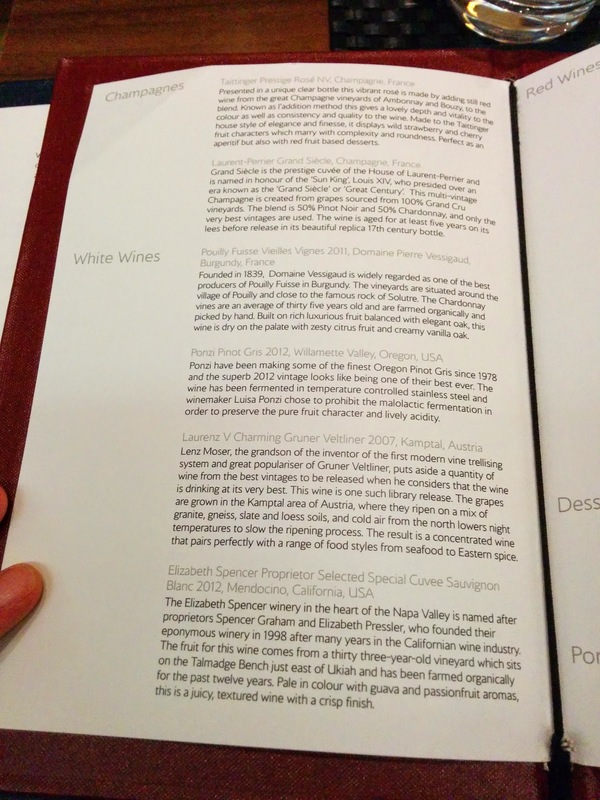 The wine list was longer than the food list, and Emil approved. The drinks, like everything else, took forever to arrive. Pouilly Fuisse Vieilles Vignes 2001, Domaine Pierre Vessigaud. 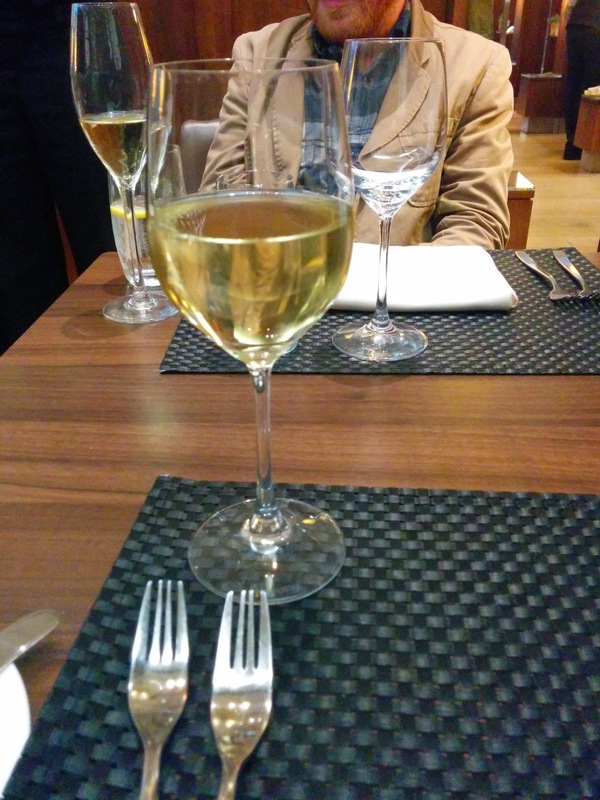 Since I ordered seafood, I decided to pick the white burgundy. It was slightly sweet, nice enough, but not remarkable. "Maldon salt-crusted fillet on creamed potatoes with carrot and honey puree and a jumble of pea shoots and peas". My seafood tendencies won out, so I ordered the only seafood option, the sea bream. As did everyone else at the table, except for one. The dishes all arrived looking pretty good, and beautifully plated. In the center of the plate, under the fish, was the creamed potatoes. They were very creamy, decent enough. Atop the potatoes was the sea bream. It looked quite good, served skin on. But looks can be deceiving. It was very over cooked, dried out, and really not good at all. It was garnished with the "jumble" of pea shoots, which were fresh and crispy, and quite nice. On the side was a schemer of carrot and honey puree, which was actually pretty delicious. Sweet, tasty. Finally, there were dots of a green substance. It might have been green pea puree? I’m not sure, it tasted sorta like green tea, not peas. It was bitter and strange. Overall, this looked far better than it tasted. The fish was the downfall: it was just way too overcooked, not seasoned, and it was questionable quality. 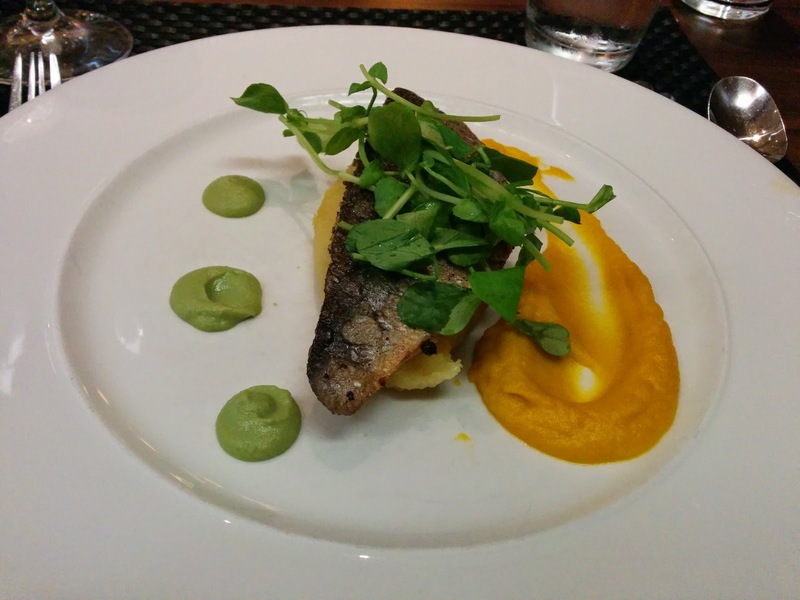 I did enjoy the potato and carrot puree, and the pea shoots, but … meh. "Creamy Arborio rice, flavoured with wild penny bun and portobello mushrooms, finished with truffle oil and shaved Parmigiano-Reggiano." The one person who didn't order the sea bream picked the wild mushroom risotto, which was my second choice. He was willing to share a few bites. His dish was much better. It was creamy, the rice was well cooked, the mushrooms hearty. But we were not able to taste the promised truffle flavor. It was not amazing, but better than what you get in many restaurants, and certainly better than the fish. "A baked silky vanilla custard originating in Trinity College, Cambridge in the 1600s, our version is finished with lavender sugar." We also asked for one of every dessert when we ordered our entrees, and asked for all of them to be delivered as soon as possible, since we realized that we were indeed pressed for time. They arrived soon after our mains. The dessert menu had the two sweet desserts and a cheese platter, and we thought we were ordering one of each. But, no cheese platter arrived for us. I guess they didn’t consider that a dessert? We started with the custard, which was actually a reasonable serving size. When does that happen? I'm so used to American-sized desserts. The moment I saw it, I immediately wished we had ordered multiples. How could four of us be expected to split just two normal sized desserts? This was my first time having burnt Cambridge cream, and although the name doesn't exactly sound amazing, the description certainly drew me in. You know that pudding is one of my most favorite things, right? 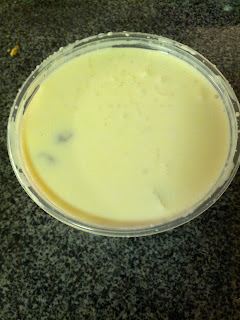 It was a bit like a panna cotta, fairly creamy, with decent texture, but not much flavor. I’m not sure where the “lavender sugar” was supposed to be. There was a garnish of sweet candy, that made the whole dish mimic a creme brûlée a bit, although obviously, the caramelized part was the candy on top, not the top of the dessert itself. But lavender? Nope. It was fine, but pretty boring, and not really anything I would get again. I have no idea if it was a good representation of burnt Cambridge cream or not, but I'd certainly try the dish again elsewhere. "A traditional English treat served warm with Cornish ice cream." 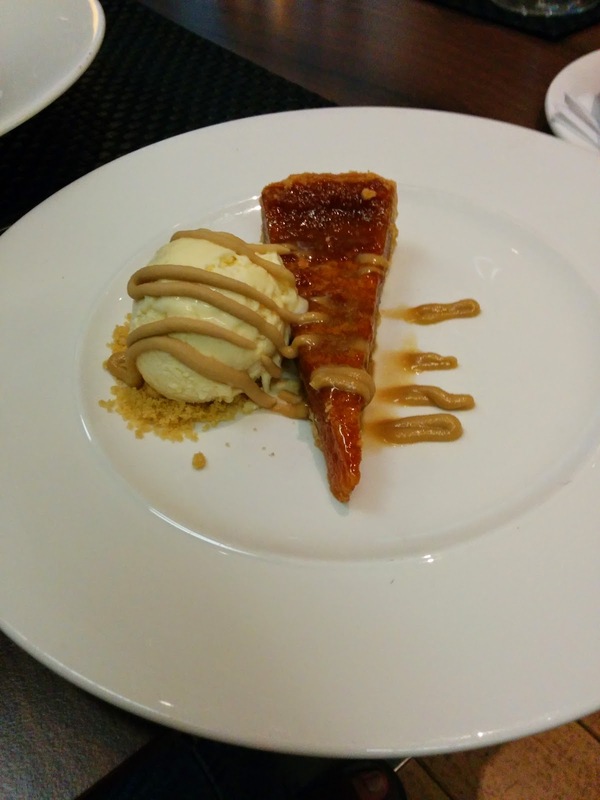 The other dessert was another British classic: treacle tart. I think this was my first treacle tart too, but I was familiar with the concept of it. Plus, you know me and my affinity for warm pie and ice cream. This sounded great! The crust was pretty generic, dry, boring. Basic shortcrust, so not flaky. The filling was a good consistency, but was really just sweet. It had nothing else to it, no depth of flavor, just overwhelming sweet. Perhaps that is how treacle tart is supposed to be? It somewhat reminded me of pecan pie, just without the pecans. On the side was Cornish ice cream, another first for me. What is Cornish ice cream? Apparently just ice cream made with Cornish clotted cream. It was creamy enough, sweet, but just ice cream. The top was drizzled with something sweet (probably light treacle? ), which I liked with the ice cream. The whole dish was served over a crumble, which added a good crunch, but it was a bit odd to have a slice of pie on top of a crumble. No component of this was great on its own, but a bite of ice cream, with some crumble, and a drizzle of sweet syrup wasn’t bad. But not worth getting again. 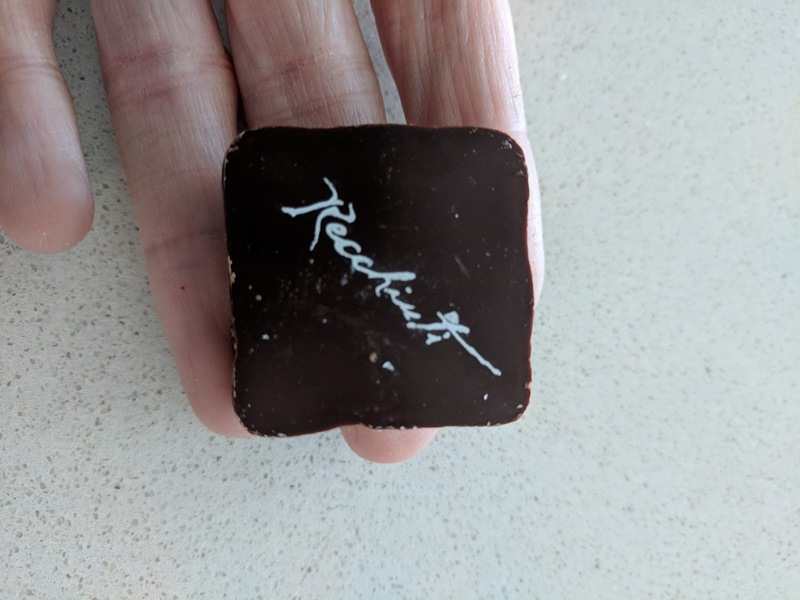 If you've ever been to the Ferry Building, you've probably seen Recchiuti Confections. It is a chocolate shop, offering up an assortment of truffles, bars, and other treats. If you are lucky, as you pass by, they'll offer a sample of their chocolate fudge or caramel sauces. When they ask, "chocolate or caramel?" the correct answer is "yes". Their goods are also sold all over town. Their products certainly aren't bad, but they also just aren't that great. I know some of my friends will seriously disagree with me here, as they love the place. The chocolate is quality, sourced from E. Guittard, El Rey, and Valrhona. Their combinations range from really creative, to higher quality takes on classics like Whoppers and York Peppermint Patties. I always really want to like their stuff, but somehow, it never impresses, certainly not worth the cost. Star Anise & Pink Peppercorn. Yup, this tasted like pink peppercorn. 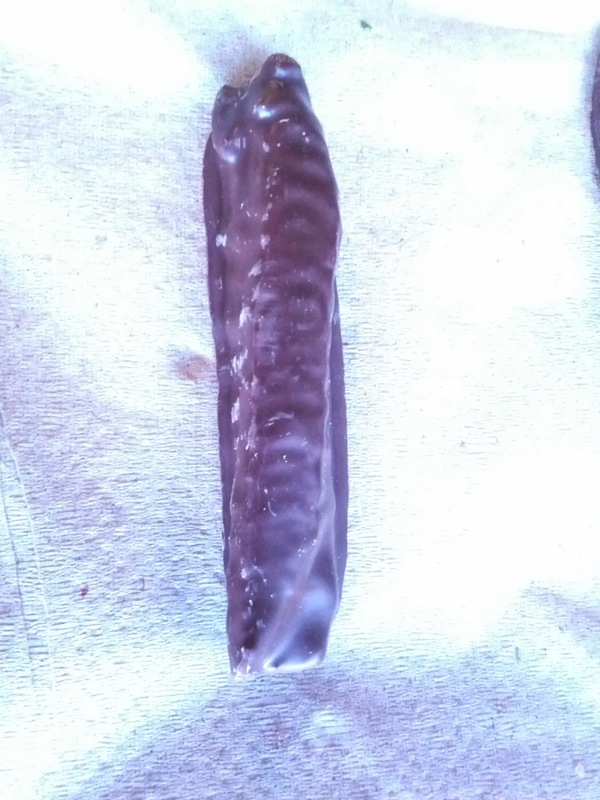 Different for sure, but really just not what I want in my chocolate. This one was really interesting. 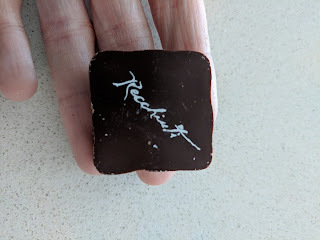 The dark chocolate ganache was creamy and intense, yet it was balanced by a very lovely jasmine flavor. I didn’t taste the green tea, but the jasmine was most certainly present. Not overbearing. A very fascinating, successful, combination. "Michael Recchiuti’s signature piece. Dark, smoky caramel blended with 70% dark chocolate ganache. Enrobed in our semisweet chocolate." This is their signature item, but to me, it is just another dark chocolate with caramel ganache. Nothing stood out in particular - the dark chocolate coating is fine, but not particularly flavorful or bitter. The filling is smooth, but the burnt caramel flavor is pretty subtle, particularly the “burnt” part. Would not purchase. Honeycomb Malt: “Organic barley malt infusion, blended in a white chocolate ganache and highlighted with the sweet smokiness of house-made honeycomb. “ Tasting notes: The white chocolate was not too sweet at all (often a problem with white chocolates, they tend to just be sweet and have nothing more to them). The honeycomb was a good flavor and left a very enjoyable honey flavored sweet aftertaste. I wouldn’t purchase this, but it was good for what it was. Lemon Verbena: “Fresh lemon verbena infusion blended in extra-bitter chocolate ganache. Enrobed in pure bittersweet chocolate.” Tasting notes: The chocolate was decently dark, but I didn’t taste the lemon verbena infusion. Force Noir: “Silky 70% extra-bitter chocolate ganache infused with whole vanilla bean. Enrobed in pure bittersweet chocolate.” Tasting notes: Very creamy filling, quite good. Semisweet: Tasting notes: just dark chocolate, nothing standout. "Delicately tart Key lime juice kisses each pear crisp bathed in smooth, dark chocolate." I didn't really taste the lime in here. The pear was super thinly sliced, and I loved the crunch. High quality dark chocolate. I liked this quite a bit and easily polished off the box. "Fresh orange peel is candied in-house and painstakingly cut by hand before being enrobed in smooth semisweet chocolate." Unlike the limes, this had a very strong orange flavor. It was also soft, rather than crispy. I think would pair beautifully with a glass of scotch! "Dried Michigan tart cherries drenched in dark chocolate with a light dusting of cocoa powder. " Very flavorful tart cherry inside. Good quality bitter dark chocolate. Both the cherry and chocolate flavors come through really nicely, neither overpowers, really good ratio of chocolate/fruit. Yum yum yum! My favorite of their pieces. Malted Revolution: "Crunchy malted cookie center, hand coated with layers of our custom dark milk chocolate blend. 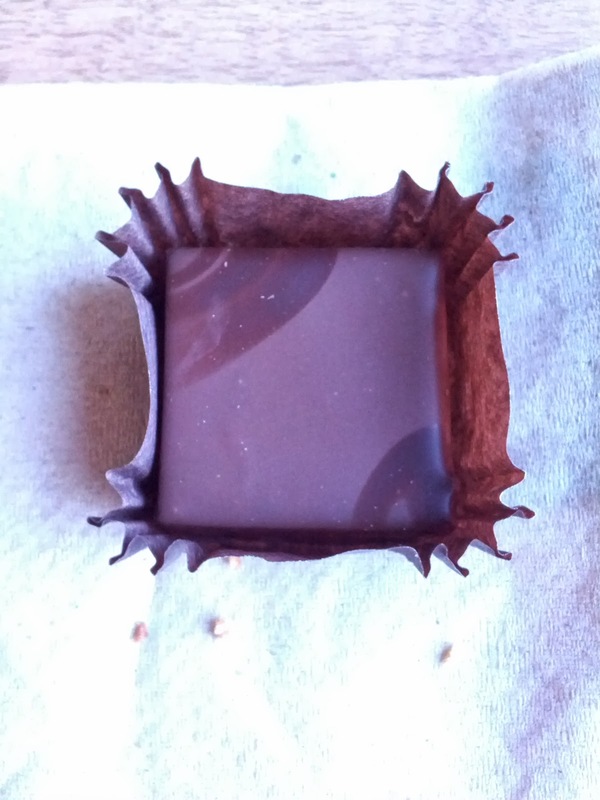 An accent of Fleur de Sel is added before a final revolution of chocolate." Tasting notes: The center is much more crisp than a Whooper. Likewise, it didn't dissolve on the tongue in the fun way a Whooper does. The center was far more malty than a Whooper. The dark chocolate is obviously higher quality than the chocolate on a Whooper, but it actually doesn’t work as well. I didn’t pick up on the fluer de sel at all. This piece was lost on me, even though I really wanted to like it. 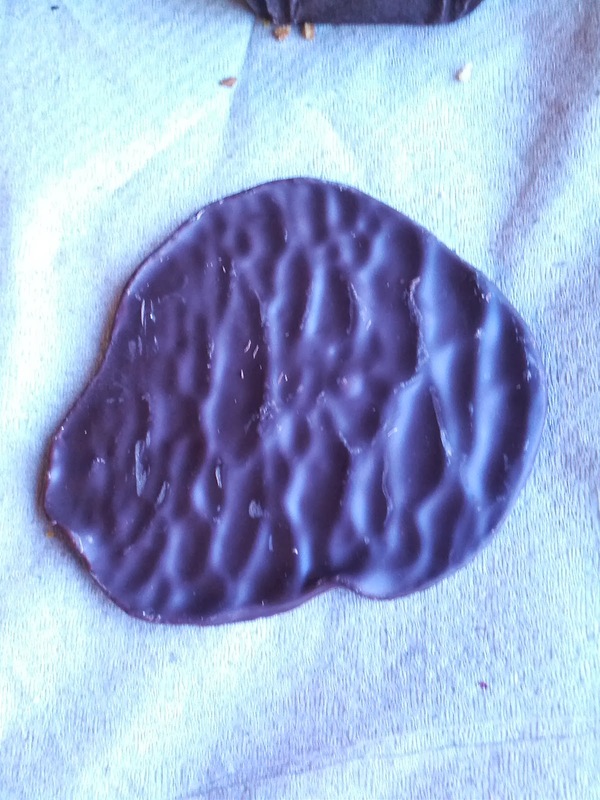 Peppermint Thin: “Organic Willamette Valley peppermint drenched in our custom blend of 64% semisweet chocolate.”. Tasting notes: This was very thin, with about an equal amount of chocolate as filling. As a result, it wasn’t minty enough for me. The majority flavor was the chocolate, with the filling giving a nice creaminess but not much more. I haven’t had a York peppermint patty in years, so I can’t compare, but I remember them having much more filling and being more minty. 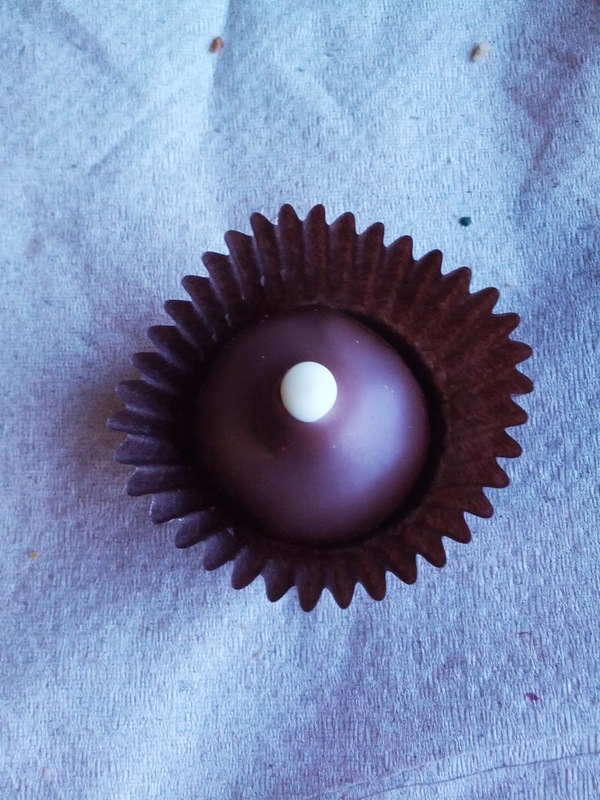 Peanut Butter Pearls: “Pearls of creamy organic peanut butter and dark milk chocolate with a crispy center. ”. Tasting notes: The milk chocolate was nice and creamy, but there wasn’t much peanut butter flavor. Or at least, not nearly enough for me! Pear-Lime Pâtes de Druits: Covered in large amount of sugar. Decent flavor, nice consistency. I don’t love pâtes de fruits in general, but this was good for what it was.